Publications - Boston Real Estate Attorney. Eviction Law. Zoning and Variances. Housing Discrimination. In 1996, Mr. Ward published a treatise/practice manual on the subject of landlord and tenant law: Massachusetts Landlord-Tenant Practice: Law and Forms. The book enjoys wide circulation at Massachusetts law schools, law libraries and among judges and lawyers alike. The book moves the reader easily from basic definitions of tenancies, step-by-step through the eviction and appeal process and into areas of landlord-tenant law the practitioner or judge will frequently encounter, such as housing discrimination, drug-related evictions and proper handling of security deposits. The majority of the book is written in easy to understand prose suitable for property managers and landlords who are not lawyers. Yet, it is extremely well annotated so that lawyers can rely on it with confidence. Mr. Ward has published another book in the series on security deposits and last month’s Rent available now on Amazon.com. 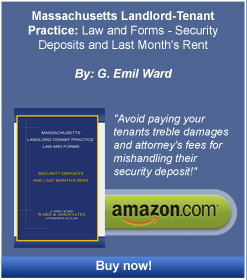 Attorney G. Emil Ward has authored a pamphlet describing landlords’ rights and responsibilities. He edited and rewrote an existing pamphlet describing tenants’ rights and responsibilities for the Massachusetts Association of Realtors and the Massachusetts Office of Consumer Affairs in September 1999. As a member of the Lawyers Weekly Board of Editors, G. Emil Ward wrote various editorials for “Lawyers Weekly” from 1999 – 2012.